Lock in a great price for Fort Young Hotel – rated 8.2 by recent guests! The hotel informed me of ongoing construction, however, when I arrived I really couldn't tell there was construction. They did a great job isolating that from the guests. The staff was wonderful and very pleasant to talk to. The room was very spacious and comfortable. Locación and view, and some of the staff that I will give 5 stars for their attention. Food was amazing. The tours that the hotel setup for us were great. The tour guides were super helpful and awesome. The staff was always friendly and answered any questions we had regarding different places/activities around Dominica. Location, view on the bay, spacious room with balcony (if you choose sea-view) Fort Young is one of the best hotels you can find in Roseau. 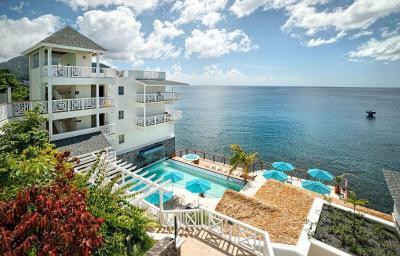 It is centrally located with an amazing view from the pool and from any room with balcony and sea-view. The staff was helpful, friendly and responsive. The restaurant is very good with sea-view terrace, but a bit expensive. In alternative you can order good and cheaper food at the bar. If you want a quiet stay, ask for a room overlooking the ocean. The other rooms, especially rooms with 500 numbers, might be noisy and too close to the bar. Service is good, but slow (as almost anywhere in the Caribbean). Overall, Fort Young is an excellent hotel in an optimal location. Room was on the sea view side and that was great. Different activities are available for the customers. Fort Young Hotel This rating is a reflection of how the property compares to the industry standard when it comes to price, facilities and services available. It's based on a self-evaluation by the property. Use this rating to help choose your stay! Guests can enjoy water sports such as diving. They can relax in the hot tub or work out in the fitness center. They can also visit the on-site duty free shops. The Dominica Museum is just 650 feet from this hotel. Morne Trois Pitons National Park and Victoria Falls are less than 30 minutes’ drive away. This room features a balcony and cable TV. House Rules Fort Young Hotel takes special requests – add in the next step! Any additional older children or adults are charged USD 36 per night for extra beds. The property will be undergoing renovations from Wed, Aug 22, 2018 until Tue, Oct 15, 2019. During this period, guests may experience some noise or light disturbances, and some hotel facilities and services may not be available.